.... some slightly surprising things. Last week the charity shops seemed a little disappointing and expensive, so I found myself leaving my thrifting "comfort zone" and looking at stuff I might pass by on a better day. Thinking about it, I guess this means I have a hard time leaving empty-handed! 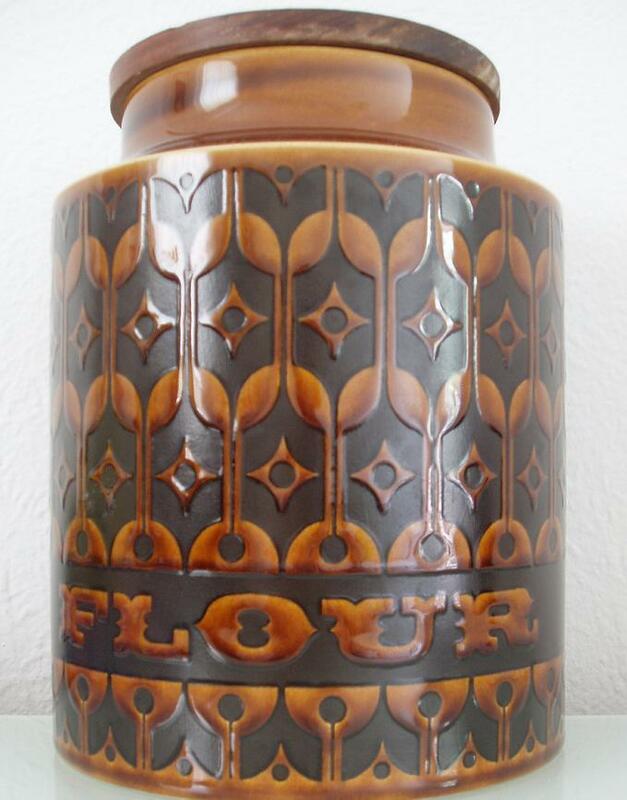 I often see Hornsea Heirloom about, mostly over-priced due to the "Hornsea" name, I think. It's kind of nice, but I don't particularly feel the urge to buy it. This Flour jar was sitting at the back of a shelf and was quite dirty. The wooden lid is good but the rubber seal has perished, meaning it's no good for storing flour any more. It was marked at £1, and I was attracted to the lettering (I love fonts). I brought it home and cleaned it, and was happily surprised to find it was in perfect condition, so it's now sitting on a shelf in my kitchen waiting to be filled with something. Every time I pass it by I notice the beautiful lustre of the glaze on the raised parts of the pattern, contrasted with the equally beautiful matt finish of the darker parts of the pattern. It has completely won me over and now I'm wondering if this is the start of a new collection. Another trip outside my thrifting "comfort zone" happened when I spotted these Holkham "owl" mugs at the back of a different dusty shelf in a different dusty shop. They were also dirty, which made them look very unappealing, but at £1 for the pair I decided to buy first and think later. I'm so glad I did. Like the Flour jar, they have grown on me, and have gone from "weird, ugly shaped things - what was I thinking?" to "beautiful, tactile, wonderful pieces of modern design" in the space of a few hours. Am I particularly shallow, or does this kind of thing happen to other people? look for the time. 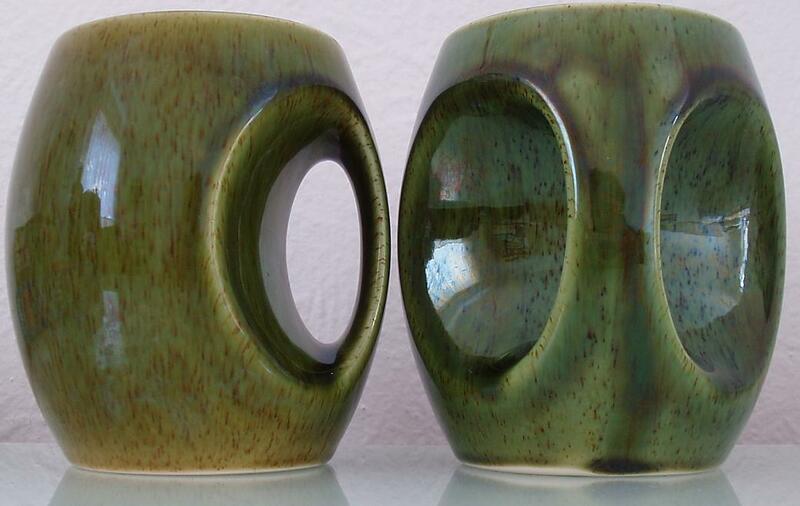 More than a million of the mugs were made. This sounds so much like the "owl" mugs, though sadly I can't be sure as there was no picture. I love the "hole in the pebble" idea. 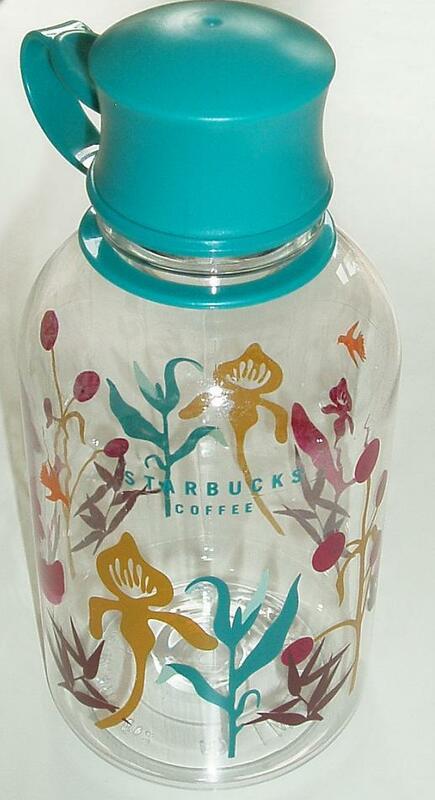 This 50p Starbucks water bottle was brand new with its original tag. Lovely colours, lovely pattern, and something that will definitely get a lot of use in the summer holidays as my family seems to drink gallons of water. That flour jar is intense. I have a few Hornsea Bronte canisters. I actually like ugly! But those owl mugs are just beautiful. Thanks for introducing me to Holkam.